This mouthwatering crisp is made with two ingredients the U.S. South is well known for -- Bourbon and cornmeal. 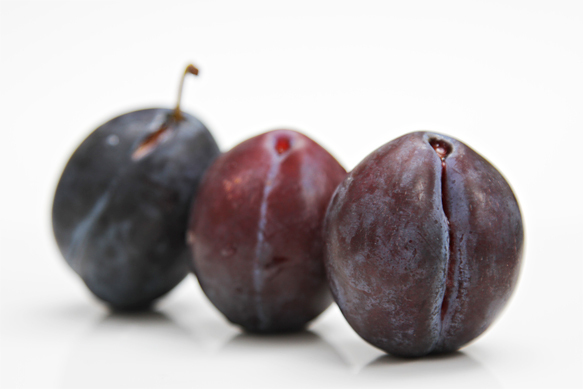 As it happens, these two ingredients pair incredibly well with ripe plums! 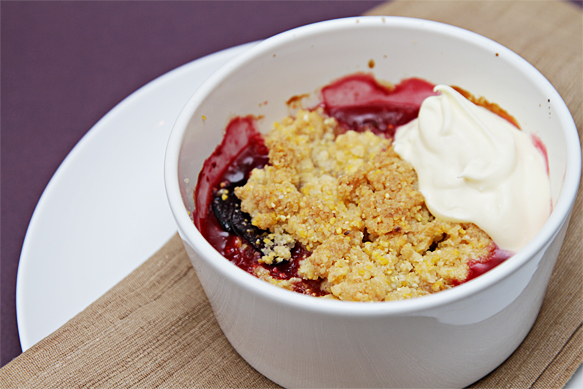 The cornmeal finds its way into the streusel that adorns the sweet-yet-tangy fruits. Along with the crystalline turbinado sugar, it gives the topping a marvelous crunch. The Bourbon ends up in the luscious crème fraîche, and ties all the elements of the dessert together in a delicious knot. The plums I always use to make this crisp are the purplish Italian prune plums (also called Empress plums). They're small and egg-shaped, with a sweet yellow flesh, but their skins are tangy and make your saliva glands tingle when you bite into one. It's that juicy acidity that makes these plums so wonderful to cook with. Because of my love affair with the petite fruit, I haven't made this crisp with other kinds of plums yet. But my guess is that it would be delicious with just about any variety. Here's wishing you a fantastic time baking this delicious crisp! Step 1: For the crème fraîche - Place the heavy cream, sugar, Bourbon and vanilla in the bowl of an electric mixer. Beat at medium speed until the cream is thick. Add the crème fraîche and continue to beat for a few seconds at slow speed until just incorporated. Transfer to a container and refrigerate until ready to serve. Step 2: Place the plum slices in a large bowl. Sprinkle with the lemon juice, sugar and cornstarch and stir until well incorporated. Spoon into the prepared individual molds (or single mold) and set aside. Step 3: Place the flour, cornmeal, sugar and salt in the bowl of a food processor. Process until well blended. Add the vanilla and chunks of butter and pulse until coarse crumbs form and start to come together (do not over-process or the mixture will form a dough). Sprinkle the streusel on top of the fruits. Bake for 45 to 50 minutes, until the streusel is golden-brown and the fruits are bubbly. Remove from oven and let cool until warm. Serve the individual crisps in their molds with a dollop of the Bourbon crème fraîche. Cook's note: The crisps can be made up to 6 hours ahead and kept at room temperature. To serve, preheat oven to 350ºF (180ºC) and bake for 6 to 8 minutes until just warmed. Leftovers can be refrigerated for up to two days, although the topping will lose its crunch.